Charleston had its first full marathon on Saturday. After all my time running races in that town, there was no way I was going to miss it. After all, I ran my very first registered event in Chucktown. This was more than just a chance to catch up with running buddies from my years in Charleston. My girlfriend Cara had recently started running, and signed up for her first-ever half marathon. We were going together. Here’s a composite of all the video I shot during the race. If you’re more interested in the photos, just scroll to the bottom of this article. My next concern was the fact that shuttle tickets weren’t included with the cost of the race. The Finish Line was miles away from the Start, and I had to separately purchase a return bus ticket for $3. There really isn’t an excuse for that. When a person pays close to a hundred dollars to enter a race, they should get a ride back to the starting line with their registration. Period. I’m sure the organizers will cite costs, but those are empty words. How much did it cost to distribute the little green arm bands, when they could simply tell the bus driver to look for a yellow or blue race bib? When you have a full marathon, half marathon, 10K and even a 5K race going on simultaneously, you have enough money to take your customers back to their cars. Even worse, people were expected to pay $5 on race day if they wanted a ride back to town. Seriously, who expects people to carry paper money with them during a marathon? A third issue was their refusal to mail packets. This could have taken considerable weight off of packet pickup, and it would have allowed people from out of town to more easily participate. 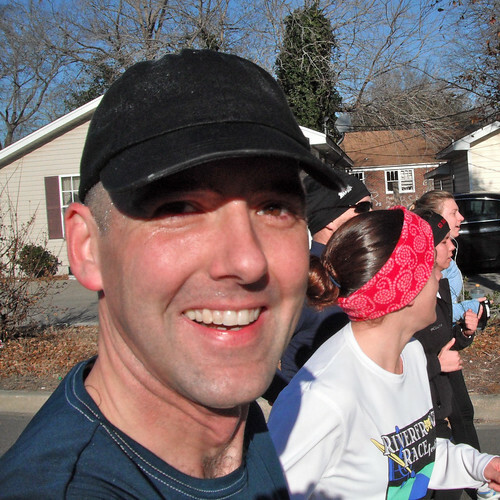 (A few moments of front-work and a bit of postage takes an entire person out of your hair during Packet Pickup.) My brother got our packets, and described a disorganized mess. My yellow race number wasn’t found in the yellow section, and Cara’s blue bib wasn’t found in the blue section. I was getting worried that the race wasn’t being organized by runners. One more beef and then I’m done. The race started out just like most of the 5K events in town. It started beautiful, and took us along the Battery. We were good for several miles until we made it past Marion Square Park. After that, we start heading for North Charleston. It’s not a bad town, but none of it would have been put into a tourism brochure. We traded the beauty of the city for dirt roads, elementary schools and industrial areas where we had to look out for potholes. There was a confusing loop in the middle, and the last four miles or so were an out-and-back into the middle of nowhere. They would have done much better to switch the Start and Finish, or to just come up with an entirely different route. Like any marathon, there were lots of nice people everywhere. Not only that, but there were people cheering and playing music for us all through the course… even the boring bits. Especially the boring bits. When you’re running through Nowhere, it’s a nice change to see a band or just a few people calling out encouragement. In this department, the folks in Charleston excelled. For the organizers, I have to say that they really knew how to handle the water stations. They were plentiful and well-placed. After 20 miles, they even handed out gel packs. That was fantastic. And lastly, there were my friends. I know lots of runners in Charleston, and it was a true pleasure to run with them again. Cara and I wimped out. Pure and simple. There was snow and ice during the week before the marathon, but before that it was just cold outside and we stayed indoors. We slacked off lots of times, and it showed in our performance. Cara had the added excuse of being in the early stages of flu recovery, but I have no such luxury. We went slow because we didn’t train. Even though I could see problems, I could also see enthusiasm. I’ll most likely run this one again next year, in the hope that they’ll tighten things up. Over all, it was a great way to see old friends and put another medal in my treasure box. Of course, next time we’ll train properly. I’d run it again but I hope the course is better organized next time – those last few miles watching all the faster runners go by (and nearly knocking people over) was killer! Yeah, that was a complete mess. At first I thought they were supposed to be on the other side of the cones, but then there were cars over there. Crazy. My Garmin measured 26.56 miles. (I’ll post it when their site comes back up.) I’m not sure how much of that is the course and how much is my zig-zagging, but it does seem like a big gap.